I’ve put a new Grbl Controller 3.6.1 installer for Windows up on the download site. Note – there is and will not be any version of 3.6 installer. 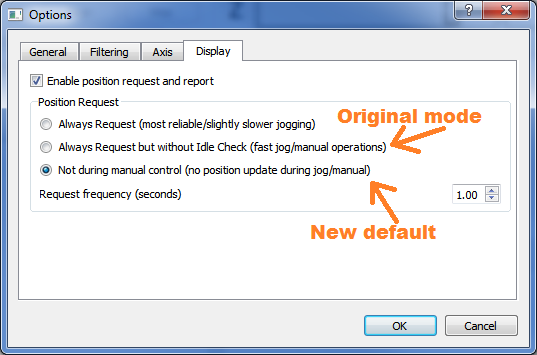 Manual/Jog control defaults to new mode which doesn’t update the position. This was done to ensure that jog motions are as fast as possible. However, if you want to have the original 3.5.1 and earlier behavior, go to Tools | Options | Display and change radio button to “Always Request but without Idle Check”. Sending files still updates position, it is only manual/jog that does not. Eventually this will be fixed to have fast performance and display updating but this is a compromise for now. This entry was posted in Uncategorized by zapmaker. Bookmark the permalink. hello..i am having issues with the output. 2- using Xloader, i have uploaded the hex file. Now when see the outputs from arduino uno pins, except pin 2,3,4 and 5, all pins are consistently high, while these 4 are consistently low. i need to know where i am making a mistake. The above mentioned steps are what exactly i have done not even a single thing different. I noticed you posted multiple places on my site. I am responding with the same response so that people can see it no matter which page they visit. First, make sure that Grbl Controller is communicating with Grbl. If you are seeing output in the status window when it connects, that is a good first step. If you type into the command box g0 z10 the Z work coordinates should update to 10.000. When I gave the g0 z10 command, pin 7 goes high. When I gave the g0 z-10 command, pin 7 goes low. Pin 4 shows PWM on my oscilloscope. This is with version 3.6.1 of Grbl Controller and 0.8c of grbl on an Uno.